David Lacz at Bartram & Brakenhoff tells me that the price of his central agency for sale, Westport's 34m motor yacht Gale Winds, has had a $1 million price reduction. Delivered in 2006, she's had $500,000 worth of factory options and upgrades spent on her and accommodates eight guests in a full beam master, VIP, double and twin. 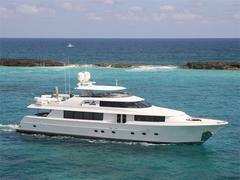 Available for inspection in Daytona, Florida, Gale Winds is now asking $6.9 million.